Are you ready for a science, technology, engineering or math (STEM) research experience with Oak Ridge National Laboratory’s prestigious scientists and engineers? Are you looking for an internship opportunity with a research or technical focus? If you are an undergraduate student at a college or university, with an interest in STEM, ORNL may be the place for you! All of the programs on this page are limited to students who have been accepted to, or are currently attending, an institution of higher education in the United States. You must be at least 18 years old by the first day of your appointment. Click on the program name to learn more about each one. 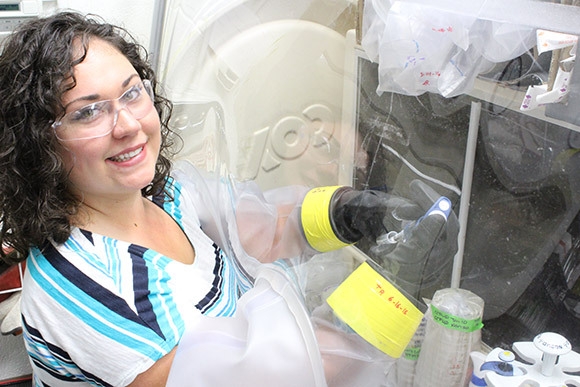 Malaney Abel, a participant in the Higher Education Research Experiences (HERE) program at ORNL, is investigating a bacterium that could improve ethanol production at a fraction of the cost.